Everyone showed up for the housewarming party at MEA member Jeff Smith’s new digs last weekend – even the high school marching band – as the Algonac teacher and his young sons received the ceremonial key to a Habitat for Humanity house. 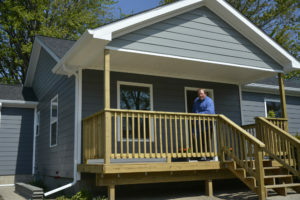 Saturday’s home dedication, attended by more than 100 community members, was the product of a partnership between MEA and Blue Water Habitat for Humanity in response to financial pressures squeezing public school employees across the state. 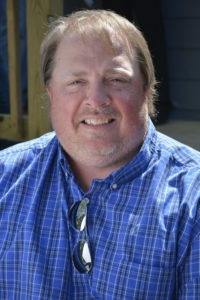 A 16-year veteran educator, Smith was financially stuck in a crowded one-bedroom duplex with his two sons when the opportunity arose to apply for a Habitat House last spring. Like many Michigan school employees, Smith has been hard hit in recent years by step freezes and pay cuts. In addition, Smith and educators statewide have been slammed by passage of a Republican-backed health care law in 2011 that dramatically increased out-of-pocket health care costs for school employees. The measure forced employee contracts to include either a fixed dollar amount a district would pay toward health insurance – a hard cap – or limit district contributions to no more than 80 percent. Members of the local Algonac Education Association volunteered many hours working on the house and held numerous fundraisers to eventually furnish the pre-teen boys’ bedrooms with items they love – University of Michigan football gear and Pittsburgh Penguin hockey décor. MEA members and staff from around the state pitched in. Even without the furnishings installed, the Smith family was overcome with joy at seeing their energy-efficient three-bedroom, one-bath ranch-style home with open floor plan, laundry room, front porch, and back deck. “It was great to see the smile on Austin and Andrew’s faces – blessed to be a part of it,” said Dennis Bacsikin, who donated all of the plumbing for the home. Bacsikin’s wife, Lisa, is an Algonac EA member who organized fundraisers for the project. A football and softball coach, Smith is admired for his leadership on sports fields and off. Coach Smitty, as he’s affectionately known, teaches at the alternative high school which caters to students who’ve struggled in school. AJ Garshott, a former Algonac football player who graduated last year, helped with a fundraiser to raise money toward Smith’s down payment. “Coach Smith has always been such a great coach and person. I’m so happy that he is finally getting the recognition he deserves,” he said. Other students volunteered to help with the build. Algonac High School junior Noah Todina, whose mother Dana is an AEA member, said it’s been amazing to see the community give back to a teacher and coach who’s done so much. A Habitat home is not a giveaway. Smith put in 50 hours of sweat equity working at the Blue Water Habitat ReStore last summer, and he logged hundreds of hours at the work site, alongside dozens of community volunteers. An August 2016 MEA Voice story told his story at the start of this Habitat journey. Applicants must meet minimum and maximum income levels to ensure they have real need but also the means to pay a low-interest mortgage, taxes, and utilities in an energy-efficient home. Applications are reviewed with no names or labels attached to guarantee fairness. It’s a hand up, not a hand-out, says MEA UniServ Director Michele Israel, who developed the MEA partnership with Habitat through a friendship that began with the non-profit’s executive director, Ernest Werth-Toward, when the two were school employees together in Port Huron. “By nature, the union takes care of its own,” Israel said. The expedited fundraising and building process for Coach Smitty’s house brought him and the community even closer together, said Roy Churchill, a community volunteer who’s worked on two dozen Habitat homes. View an online photo album from the dedication ceremony.